Cryovials are the choice when long-term storage of your most precious samples are needed. These hardy tubes are designed to seal tightly and preserve tissue and cells in temperatures as low as -196°C. There are several considerations to be aware of when selecting the proper cryovial. 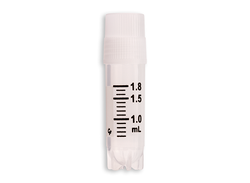 Besides selecting the volume (we carry cryovials from 1mL to 5mL in size), one needs to consider the correct fit. The choice between external threads and internal threads is often based on more than personal preference or cosmetic tastes. An external threaded cap can cause cryovial caps to bump into one another and not fit correctly inside a freezer box. Internal thread cryovials offer a more streamlined look and fit. 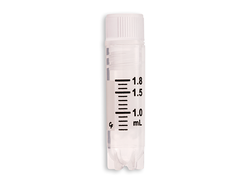 Some cryovials are designed to fit easily in freezer boxes and tube racks created for 1.5ml "eppendorf" tubes. Our standard cryovial requires a little additional spacing. When ordering, consider either one of our BioBox polycarbonate freezer boxes or our 81-place cardboard freezer boxes. We carry a special series of racks that accommodate these as well. If 100 place boxes are a must, then you will love our TrueNorth brand with a flush cap that fits all types of boxes. Older cryovials utilize a rubber O-ring gasket to seal the tube. Our innovative vials feature a co-molded screw cap that combines polyethylene (PE) with a thermoplastic elastomer (TPE) that eliminates the need for silicone o-rings. Traditional vials have the potential for contamination if the o-ring is lost, cut or bulge due to over-tightening of cap; our vials enable a safer sample storage environment.